My friend came for lunch the other day and in advance I’d taken some ready-rolled puff pastry out of the freezer to make us a quiche lorraine. However, after it had defrosted I unrolled it and, upon getting a lovely waft of butter scent, I remembered that it was actually a sheet of Marks and Spencer’s all-butter puff pastry. Now, as much as I like my friend who was coming for lunch, I couldn’t bear to waste this beautiful pastry on a simple quiche. As a result, I made the quiche lorraine with a homemade thyme pastry crust and devoted the all-butter puff pastry to making a batch of palmiers instead. If you don’t already know, palmiers are French pastries that are made from sheets of butter-enriched puff pastry and coated in sugar before being folded (or rolled) from each side into the middle to create the distinctive shape of a palmier. A popular variant of palmiers are arlettes, which are essentially the same thing, but have cinnamon added to their sugar topping and are rolled into flat discs before baking. Palmiers have to be one of the easiest biscuits I’ve ever made, mainly because if you buy a batch of all-butter puff pastry then most of the work is done for you. It’s literally just a case of rolling out the pastry, scattering it with a little water and sugar (and cinnamon, if you fancy) and then rolling it up before cutting it into slices. You can’t get any easier than that! I made these palmiers with normal puff pastry (i.e. not gluten-free or dairy-free) because I knew that by only having one I wouldn’t suffer any ill-consequences, but you could make them with gluten-free puff pastry if you like. I’ve never seen an all-butter gluten-free puff pastry before though, so if you’re going to use the gluten-free pastry you might need to add a bit more sugar and cinnamon to help add flavour to the palmiers. If you do that and find they still don’t hit the spot I’d drizzle them with melted dark chocolate. They’d be awesome! 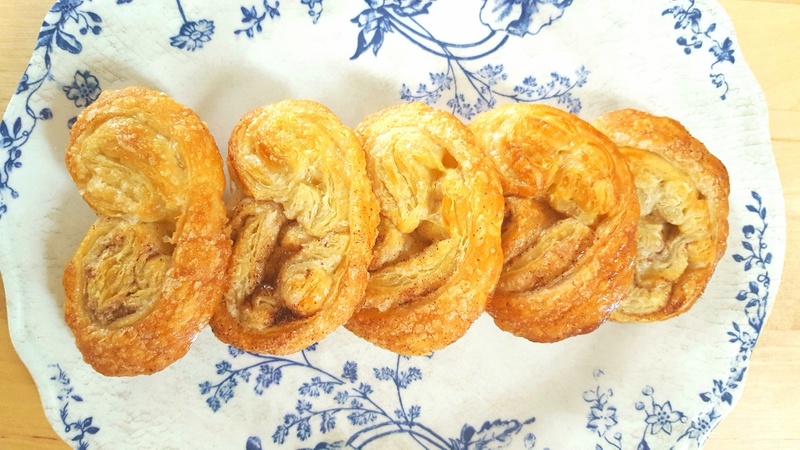 If you make these palmiers you’ll be rewarded with a batch of flaky, butter-enriched pastries which crumble and fracture into sweet shards of butteriness in your mouth while infusing it with a delicious blend of crisp, caramelised sugar and warm cinnamon flavours. These went down a treat in my house. I wonder how long they’ll last in yours? If you’re using the cinnamon, mix it into the sugar. Roll out your puff pastry until it’s a large rectangle and lightly wet it with a little cold water. Scatter half of the sugar over the pastry and spread it until it’s even. Turn the pastry over, wet it again, and scatter the other half of the sugar over it and spread it until it’s even. Take the left and right sides of the pastry and fold them into the centre of the pastry so the two sides meet in the middle. Repeat once again and then fold the two sides together so that a large sausage shape is formed. Turn the pastry horizontally and cut it into 1 cm thick slices before lying them on the baking trays with a generous gap between each palmier. Scatter them with a little more caster sugar and then bake them in the oven for 12-15 mins or until puffed up and golden brown. Leave on a cooling rack to cool slightly before eating.